MOA SIGNING. Michael Lin and Benny Chen, president and chairman, respectively of the Taiwan Chamber of Commerce & Industry in the Philippines, Inc. discuss their points of interest in Bohol as well as what Taiwan can offer to propel the economy with BCCI Pres. Al Uy and Executive Vice Pres. Argeo Meliso (both back of camera) during the MOA signing at the Belian Hotel last Thursday. The attractiveness of Bohol as an investment haven did not miss the attention of Chinese investors, both from mainland China and from Taiwan. 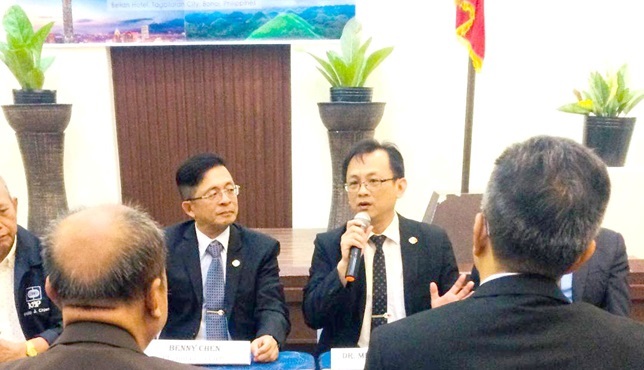 The top honchos of the Taiwan Chamber of Commerce & Industry in the Philippines arrived here last Thursday to sign a memorandum of agreement with the Bohol Chamber of Commerce Industry (BCCI) to signal the agreement to explore each other’s investment potentials. The Taiwanese group was led by its founder Philip Chien, Chairman Benny Chen, and President Michael Lin who signed the MOA with BCCI Pres. Al Uy and Executive Vice Pres. Argeo Melisimo signing in behalf of the Bohol chamber. According to David Huang, investment and promotion advisor, the group will focus in bringing the modern technology in agriculture to boost the production of fruits, vegetable and rice. He cited that the number of Taiwanese travellers reached to 15.6 million. The officers who took their oath before the governor last Sunday at the Bohol Cultural Center were Chairman – Yanhu Liang, Director General – Jun Zhon, Secretary General – Yang Yu, Directors: Wang Chen Qin, Liu Lin, Chen Yian, Pin Zhang, Weng Latian, Feng Pan Jun, Ren Jian Cheng, Guan Hua Wei, Zhang Deli and Hang Zhanglian. In his acceptance speech, Liang who is the investor of a housing project in Alburquerque promised to help uplift the economy of Bohol. Consul General Jia Li of the Chinese Embassy who witnessed the oath-taking also promised to bring more investments to Bohol. Li also thanked the PGBh through Gov. Chatto for the support and hospitality that have been given to the more than 100 families of Chinese investors in the province. The BCCAC has investments on hotels, dive shops, ready to wear (RTW), agriculture/fishery, travel and tours, housing and condominium. In Cantaob, Sierra-Bullones there are more than 20 hectares (has.) of land areas developed by the Chinese for vegetable production supplying malls and markets in Bohol. Gov. Chatto lauded the association of which the group of investors coming from China run their investments here and other parts of the country showing the good relationship between the Philippines and China. He said the opening of the Bohol Panglao International Airport augurs well for business establishments of Boholanos and Chinese moving Bohol towards economic growth. In behalf of City Mayor John Geesnell “Baba” L. Yap, City Administrator Edi Borja congratulated BCCAC and stated that the city is doing its best to develop a China town. The BCCAC proposed the holding of the Bohol Chinese Friendship Day which is tentatively scheduled on February 20, 2019. This aims to strengthen the relationship between the Chinese investors, Boholano Chinese community and Boholano people.